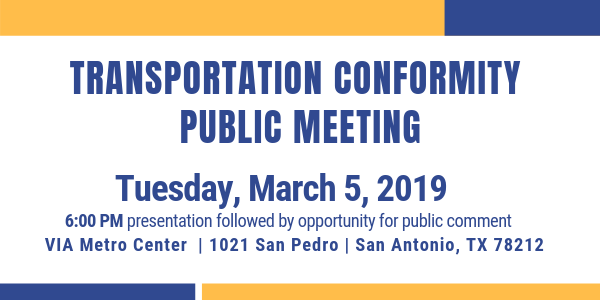 The MPO invited input on its 2019 Transportation Conformity Document during a 60-day public comment period January 29 - March 29, 2019. All public comments received are being addressed and documented in the draft document. Transportation conformity addresses air pollution from cars and trucks, called on-road mobile sources. These vehicles are a source of air pollutants that contribute to ozone. Ozone, a major part of smog, causes detrimental short-term and long-term health effects, especially for children, older adults, people with respiratory disease and people who work outside. Transportation planners and air quality professionals conduct a transportation conformity analysis to estimate the effects of transportation projects and plans on air quality. The transportation conformity process is required of all MPOs within nonattainment areas – regions that the United States Environmental Protection Agency has determined do not meet air quality requirements. Effective September 24, 2018, Bexar County is a marginal nonattainment area following exceedance of the 2015 National Ambient Air Quality Standard for ozone. Ozone levels here will be reassessed in September 2021 using air quality data from 2018, 2019 and 2020.